ART & SCIENCE - A TRIP TO THE "BAMFIELD MARINE SCIENCES CENTRE"
BMSC is a world-class teaching and research facility located on the outer west coast of Vancouver Island, British Columbia, Canada. The Marine Centre supports diverse coastal and marine research of the highest calibre and is recognized as among the very best research and training facilities in the world. BMSC invited selected artists from the Federation of Canadian Artists to attend a 3-day field trip January 24-6, 2009. The objective was for each artist to donate an artwork for a fundraising show titled "Oceans of Art" held June 11--29, 2009 at the Nanaimo Art Gallery, Nanaimo, BC, Canada, Proceeds of artwork sold from the show in Nanaimo and from the ongoing online gallery "Oceans of Arts" go towards the BMSC Public Education Program's bursary fund. I made my own sketchbook, I created the covers, selected the paper, ripped it into the dimensions I needed, folded it into signatures and sewed those into the book covers. I gave several of the pages a background: white, black or gold gesso; gloss medium or a heavy white gesso that had texture impressed into it. 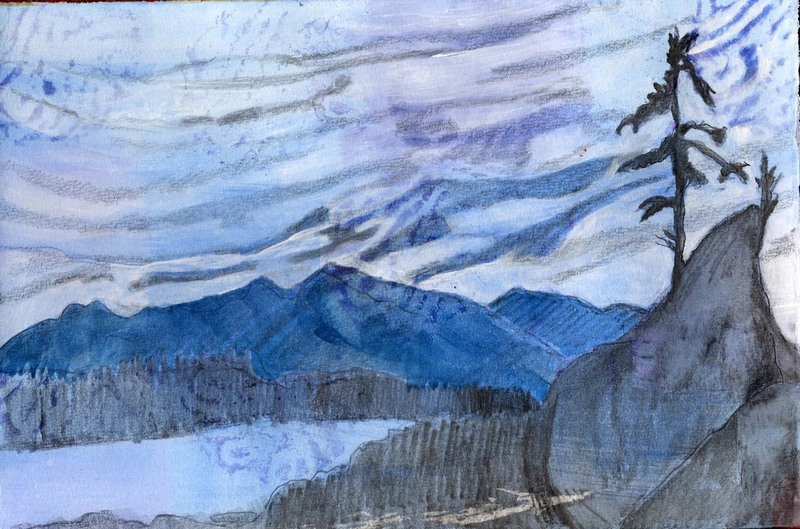 I used Strathmore Aquarius II Watercolor Paper for the signatures (pages) in my sketchbook. “Strathmore Aquarius II is made with an innovative combination of cotton and synthetic fibers that work beautifully with all water media techniques. This lightweight 80 lb (170 gsm) sheet was created to reduce the buckling and swelling found in other sheets of the same weight.” I have used this paper for my mixed media work with acrylics and various drawing mediums. It lays flat and takes a lot of abuse. I just love this paper. I also sewed in two signatures of Mylar. Images below illustrate the art kit I packed to take on this field trip. 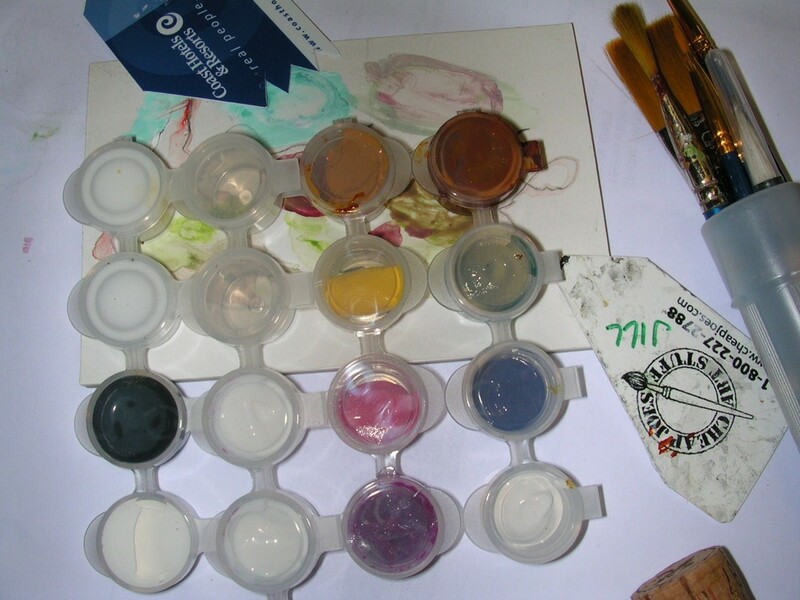 I packed small containers of fluid acrylics and mediums; small watercolour sets, pencils, pens and watercolour pencils. The images below are a sampling of the trip. Click on thumbnail to see larger picture. The first image is a map showing Bamfield in relationship to Port Alberni, Nanaimo and Vancouver. The vessel we sailed on was the M.V. Frances Barkley, built in 1958. We left at 8:30 am Saturday January 24th from Port Alberni and arrived at the Bamfield Marine Sciences Centre dock around 11:30. We had a great boat trip - about halfway we left the bad weather behind and could see clear skies and sunshine ahead. We had good weather the whole time away; the last night we were there it snowed while we were sleeping and we awoke to a few inches of snow on the ground. It didn't rain once while we were there. The first four buildings are part of the BMSC. The last picture of buildings is West Bamfield - straight across from the Marine Sciences Centre. 2. Video "At the Edge of the Sea" a BBC Natural History unit production which was filmed at the Bamfield Marine Sciences Centre. 3. 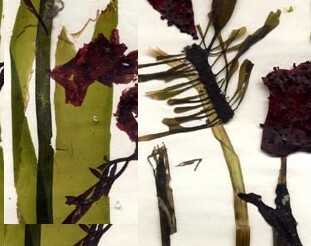 Lab: Marine botanical inspiration an algal art. Staff members gathered dozens of examples of seaweed for us to look at which were displayed in water-filled glass dishes. 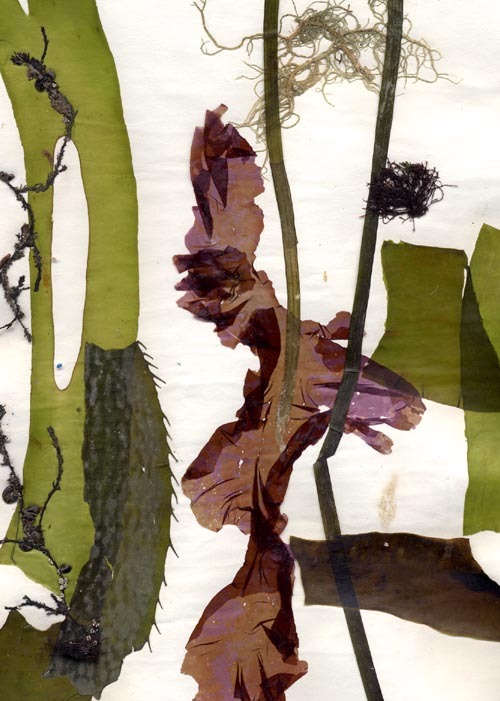 Anne Stewart described how to make "Algal Art". Select pieces of seaweed, lay those on top of a piece of wet paper that has a fibre content that is low in acidity and high in absorbency. Lay this in a press to dry flat. Heavy duty wax paper was laid over top of the piece and then placed between many sheets of newspaper, j-cloths and cardboard to absorb the moisture. Heavy weights are put on top. This takes several days to dry. 4. Field trip to see the sandy shores and rocky sea stacks at Brady's Beach. We spent a couple of hours sketching and taking photos. 5. "Ocean Explorations and Island Crusing" on the BMSC research vessel Alta. The captain did an open ocean sampling, the dredge brings up a big bucket of what looks like sand and broken shell and dumps it in a big container. After our instructor Anne Stewart added ocean water she then separated things and found all these treasures which she put in the yellow dish pan. Everything is safely returned to the ocean.On the top right is my roommate Jeanne Aten aboard the Alta. 6. Coastal boidiversity, reflections in the inlets of Bamfield and plankton collection. 7. Field trip to the open coast sandy shores of Pachena Bay with a beach fire and a meet with local artists. 8. Lab, "The big world of small things" - the micorscopic examination of the plankton was held in the biotechnology lab. I was so fascinated by this micro world that I based the painting I donated to the "Oceans of Art" fundraising show on plankton. With the trip over and back home in the studio I began my research into plankton by looking on the interent at hundreds of images and scientific drawings. 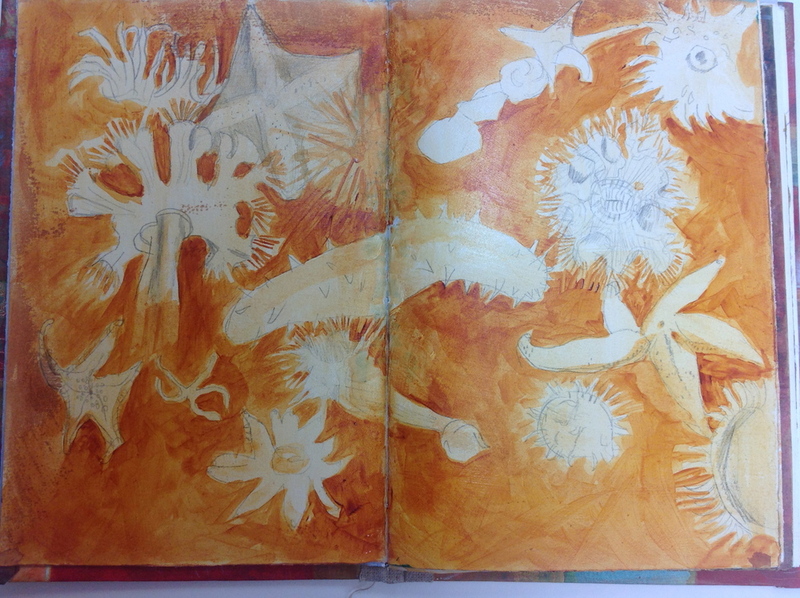 The sketchbook below is based on my plankton research. There are numerous sketches of Diatoms - centric and pennate and Dinoflagellates. I combed through all of the data I had gathered and made a list of all the descriptive and movement words I could find that described plankton and the ways in which plankton moves. I made notes of all the colour descriptions I could find. This type of info feeds my imagination. While the term red tide doesn't accurately describe the colour we see when there is a plankton bloom, I used artistic license and made a red painting - what artist could resist that. 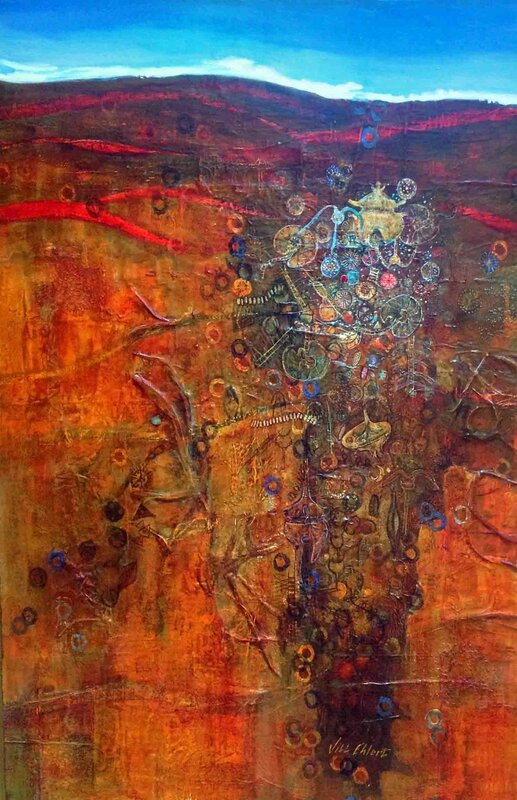 Below are details from my painting "Big World of Small" . Click each image to enlarge. Below are other plankton works. 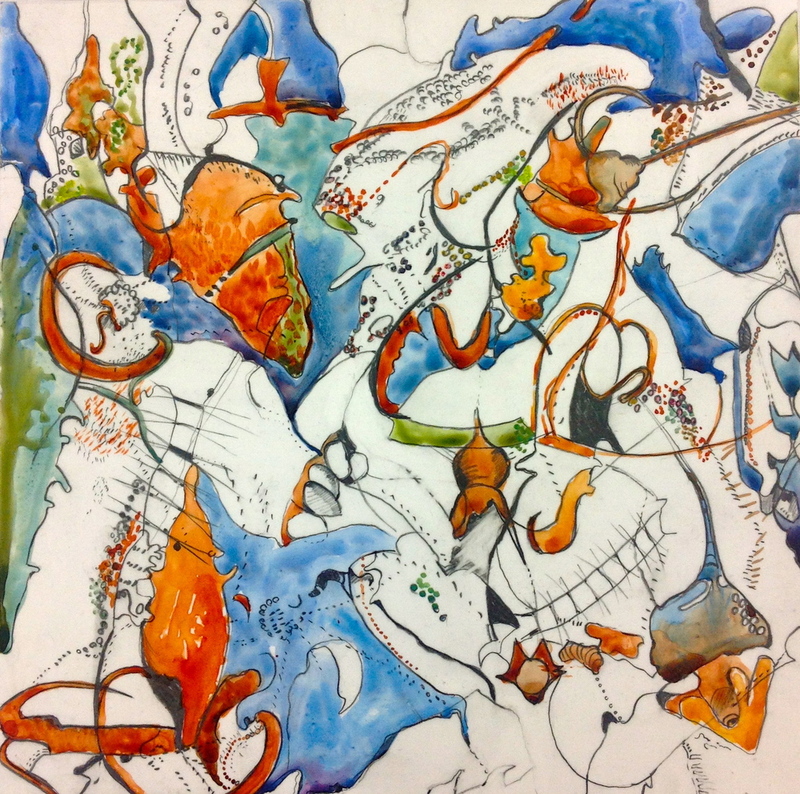 Fluid acrylics and pencil on mylar mounted on paper and adhered to a cradle board. 12x12 inches. This plankton piece to the right was created by carving directly into a cradle board with a Dremel tool. It is painted with acrylic paint.